Some Indian officials are expressing concern that New Delhi’s strategic projects in Sri Lanka are at risk as a constitutional crisis unfolds in the island-state, giving rival power China an opening to further expand its influence at India’s southern doorstep. Political turmoil erupted in Sri Lanka last week when President Maithripala Sirisena sacked Prime Minister Ranil Wickremesinghe and replaced him with Mahinda Rajapaksa, a former president who had cemented bilateral ties with Beijing and ushered in a host of Chinese-built and financed infrastructure projects. But Wickremesinghe refused to step aside, setting off an ongoing constitutional crisis. The move by Sirisena caught officials in the Indian government off guard. “We never expected this current political drama to happen. We were very keen to see that the projects New Delhi is involved with in Sri Lanka go through,” a senior official with India’s Ministry of External Affairs who requested anonymity, told BenarNews. “Ranil Wickremesinghe is our best bet till elections take place. The projects we are connected with are for Sri Lanka’s development and will not boost our economy, but we don’t want a third country helping with those. These are strategic projects for us to keep our adversary at bay,” the official said, referring to China. Apart from sacking Wickremesinghe and installing Rajapaksa – who was known for his autocratic presidency and was widely seen as pro-China – Sirisena ordered parliament suspended until Nov. 16. Wickremesinghe has described his sacking as illegal and said he still had a majority of support among lawmakers. 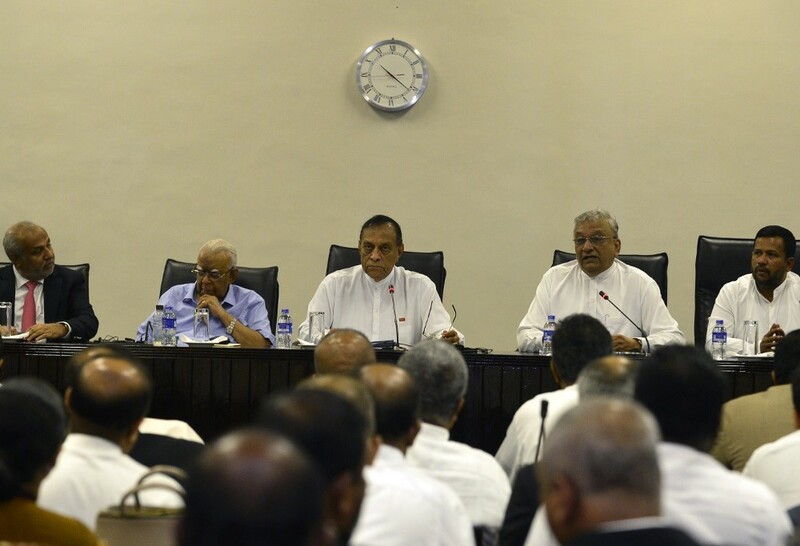 On Friday, Parliament Speaker Karu Jayasuriya summoned the legislature to convene next week in defiance of Sirisena, after Jayasuriya held a meeting with MPs who back Wickremesinghe, according to news reports. China and India, rival Asian giants, have been contending for influence in Sri Lanka, a small island strategically located off India’s southern tip and along major Indian Ocean shipping lanes. During the past decade or so, Beijing has pumped billions of dollars into building ports, highways and power stations. These projects include a massive port at Hambantota on Sri Lanka’s southern coast that was constructed as part of the One Belt, One Road Initiative – China’s plan for an infrastructure network stretching from the Far East to Europe via sea and land. Because of Sri Lanka’s dependence on Chinese loans to finance such projects, Colombo became straddled with a huge debt. Last year, Prime Minister Wickremesinghe himself was criticized for agreeing to relinquish control of the Hambantota port to China as well as give the Chinese a 99-year lease on the land surrounding the port as a way of easing Colombo’s debt to Beijing, reports said. In Washington this week, U.S. Defense Secretary Jim Mattis said he had heard at a recent summit of regional defense chiefs in Singapore that Asian and Southeast Asian nations were concerned about accumulating too much debt with China. “You see what happened in Sri Lanka, where they lost sovereignty over their own harbor,” the Press Trust of India (PTI) quoted Mattis as saying. The speed with which Beijing congratulated Rajapaksa after his sudden elevation to prime minister on Oct. 26 has fueled Indian worries that he is still pro-China. However, a former Indian ambassador to both Sri Lanka and China, Ashok Kantha, did not agree with the view that labels Rajapaksa as pro-China. “We should not look at the current political crisis through the prism of relations with China,” he told BenarNews. “We should not fall into the trap of characterizing person A as ‘pro-India,’ person B as ‘pro-China.’ That’s a very facile, simplistic way of looking at politics in a neighboring country with which we have very close engagement,” Kantha said. He added that Indians should not “become paranoid” about China’s role in Sri Lanka. Kantha served as ambassador to Beijing, from 2014 to 2016, after serving as Delhi’s envoy to Colombo during the previous four years. China was paying close attention to the change in leadership in Sri Lanka but would not interfere, a senior government official said in Beijing. “China will stick to the principle of not interfering in the domestic affairs of other nations,” Foreign Ministry spokesman Lu Kang said in a press briefing on Monday, according to the South China Morning Post. Since being installed as PM, Rajapaksa has sent out feelers to India because he knows he cannot ignore Sri Lanka’s giant neighbor to the north, the official with the External Affairs Ministry and Kantha both said. “It is in our interest to respond. Eventually we will be dealing with powers of the day. Rajapaksa is smart, he knows the Chinese are friends of none. He has already been bitten once. He may not want to put all his eggs in one basket again,” the official said, alluding to Rajapaksa’s previous close relationship with Beijing. India has invested in projects in post-war Sri Lanka. In 2009, the government of then-President Rajapaksa ended a 26-year separatist war waged by Tamil Tigers rebels, through a brutal northern offensive that was boosted by Chinese military aid. New Delhi’s current interests in Sri Lanka include plans by the Airports Authority of India (AAI) to develop Palaly Airport in Jaffna, the capital of the largely ethnic Tamil north. The airport will be Sri Lanka’s first one in its northern region and will provide direct connectivity with southern India, Malaysia and Thailand, officials said. India has also offered to develop the Kankesanthurai airport, which is also in northern Sri Lanka. Other key joint ventures include a proposed joint venture to run the Mattala airport in the island’s Southern province; an LNG terminal near the capital Colombo; and the joint development of an oil storage facility in the eastern port town of Trincomalee, according to The Hindu newspaper. “At this point our strategic projects will be slowed down. However, they can’t immediately be taken on by anyone. Whether the Chinese will make inroads, this may not happen. Rajapaksa is mending his ways – in any case we were not expecting much till elections,” the anonymous official told Benar. Sri Lanka’s next general election, in which the offices of prime minister and president are both up for grabs, is due in 2020.